Whoever said you can’t wear white after Labor Day didn’t know how to shop. True, it’s best used to defend against the sun’s scorching heat, but don’t white out the color once September hits. Don’t take my word for it. Designers like Diesel, who has been at the forefront of the denim evolution, show you how it’s done in style. Style Advice: Admittedly, white can be a tricky one to pull off. Plus, it can get dirty with ridiculous ease. Luckily for us, even dirty white is ‘in’ these days. Just don’t confuse dirty with unclean. If you are going to invest in white, then a denim jacket is perhaps the second-best place to start (the first is clean white sneakers). Take your style game to the next level with this G-Star Raw denim moto jacket. If super bright white is just not your thing, then consider off-white or ‘eggshell.' It’s much softer on the eyes and, in some circles, it has more swagger than super white (plus you can match it with more stuff without looking like you’re in Miami Vice). These J. 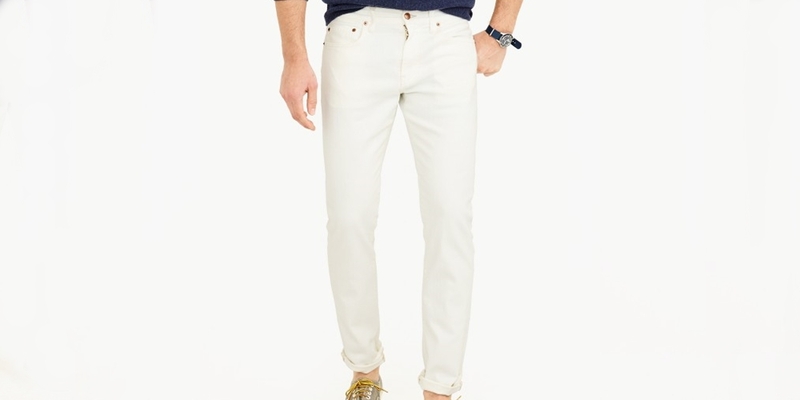 Crew rinsed white jeans are a perfect example. Remember that the first investment you should make in the world of white gear is shoes. And there’s so many to choose from. Adidas has stepped up in a big way over the past few years with its lifestyle shoe collection, and these white Tubular Shadow shoes are no exception. They are comfortable, fresh and not to mention they look inspired by the ubiquitous Roshes or Yeezy’s (without that price tag though!). You just can't go wrong with that. White T-shirts may seem too basic or boring to go over, but actually, a luxurious white tee is a wardrobe staple. You can wear it under a suit jacket or under a leather moto jacket. Or wear it plain. James Perse is a king of comfortable shirts, and his white jersey pocket tee is a piece that will get better with time. Must-Have: Whether you are enjoying the pool or not, 'tis the season of sun. That means keeping cool with comfortable, breathable material. For your feet, you can’t get more breathable than sandals. Gucci’s classic Pursuit 72 Rubber Slides are the must-have sandals of the season. These come in black and white, the latter of which really pop with the traditional Gucci green and red stripes. For a more affordable, yet still luxurious option, you can check out these similarly styled white Lacoste sandals. Just don’t wear either of these – or any sandals – with socks. We’re just not there yet. Industry Update: If you’ve never considered Under Armour as a fashionable brand, you may change your mind soon. Or at least that’s the company’s hope as it just struck a deal with fashionable rapper A$AP Rocky to try and latch onto the success Adidas and Nike are having in the lifestyle department. This collaboration may seem strange on the surface, but A$AP Rocky has a history of fashion collaborations, and Under Armour is in dire need to make some waves in that segment. At a time when athleisure is fashionable, let’s hope – for the consumer’s sake – this odd couple pays off.